Imperial County S-30 shield posted along California 78-86 (Main Street) west prior to the intersection with Center Street in Westmorland. Photo taken 03/14/09. Originating at California 98, Imperial County S-30 follows Brockman Road north across the New River to McCabe Road east and Forest Road north. Crossing over Interstate 8 west of El Centro, Imperial County S-30 (Forrester Road) traverses the predominantly agricultural valley as it treads along a path west of California 86, avoiding the more populated areas along that state route. The county road will travel north through unincorporated areas until meeting California 78 and 86 in the city of Westmorland. A diamond interchange joins CR S-30 (Forrester Road) with Interstate 8 two miles west of the El Centro city line. Photo taken 03/14/09. Imperial County S-30 bee lines 1.6 miles north from Interstate 8 Continue to CR S-80 (Evan Hewes Highway), which leads west toward Naval Air Station El Centro. Photo taken 03/14/09. Northbound Imperial County S-30 (Forrester Road) approaches Ross Road. Ross Road becomes Ross Avenue through residential areas of south Centro. Photo taken 03/14/09. Reassurance shield marker posted along Forrester Road north after Ross Road . Imperial County uses cardinal direction banners on most of its county roads, unlike the majority of other counties across California. Photo taken 03/14/09. Northbound Imperial County S-30 (Forrester Road) approaches Imperial County S-80 (Evans Hewes Highway). The historic route for U.S. 80 follows Adams Avenue through El Centro to the east. Photo taken 03/14/09. CR S-80 (Evan Hewes Highway) ventures west to Seeley, passing one mile south of N.A.S. El Centro. Through El Centro, CR S-80 overlaps with SR 86 to bypass Downtown. Photo taken 03/14/09. Imperial County S-30 (Forrester Road) advances 17 miles north from Historic U.S. 80 to Westmorland. Photo taken 03/14/09. Continuing north, Imperial County S-30 (Forrester Road) crosses a railroad line that leads west toward Plaster City and San Diego and east toward El Centro. Photo taken 03/14/09. Daytime headlights are required on Imperial County S-30 (Forrester Road) between U.S. 80 and Westmorland. Photo taken 03/14/09. Northbound Imperial County S-30 (Forrester Road) approaches Hackelman Road. Photo taken 03/14/09. Tall power lines briefly follow northbound Imperial County S-30 (Forrester Road) north of Hackelman Road. Photo taken 03/14/09. The next major intersection along northbound Imperial County S-30 (Forrester Road) is with Aten Road. Photo taken 03/14/09. Northbound Imperial County S-30 (Forrester Road) approaches Imperial County S-28 (Worthington Road) east to the city of Imperial and California 86. Photo taken 03/14/09. Imperial County S-28 begins at this intersection and travels east through Imperial to cross the valley, ending at California 115. Photo taken 03/14/09. An Imperial County S-30 trailblazer is posted along Forrester Road after the Worthington Road intersection. Photo taken 03/14/09. Northbound Imperial County S-30 (Forrester Road) approaches Wienert Road. Photo taken 03/14/09. Prior to crossing the New River and intersecting Larsen Road, a high-voltage power line crosses over Imperial County S-30 (Forrester Road). This line travels north through the Imperial Valley and around the western shore of the Salton Sea to interconnect with the power grid in the Coachella Valley within Riverside County. Photo taken 03/14/09. Northbound Imperial County S-30 (Forrester Road) approaches Larsen Road. The profile changes as the road abruptly descends into the New River valley. The river cuts through the valley making the area even lower than the surrounding below-sea-level areas. In general, CR S-30 loses elevation as it travels north. At Mount Signal, CR S-30 starts at an elevation of 17 feet below sea level, and it lowers to an elevation of 159 feet below sea level in Westmorland. Photo taken 03/14/09. The New River flows north from Mexicali across the border into the United States, then empties into the Salton Sea. Due to urban runoff and agricultural runoff from nearby farms, the river carries a fair share of pollutants and subsequently is not safe for entry or use. Its condition has exacerbated problems along the southern portion of the Salton Sea. Photo taken 03/14/09. A reassurance shield for Imperial County S-30 north stands after the New River bridge. Photo taken 03/14/09. Northbound Imperial County S-30 (Forrester Road) approaches Imperial County S-27 (Keystone Road) east across the Imperial Valley. Photo taken 03/14/09. CR S-27 connects CR S-30 with SR 86, SR 111, SR 115, CR S-32 and CR S-33. This is the western terminus. Photo taken 03/14/09. CR S-30 north crosses the Westside Canal, which carries irrigation water through the western section of the Imperial Valley to nearby farms and local users. Photo taken 03/14/09. Northbound Imperial County S-30 (Forrester Road) approaches Imler Road west to the United States Navy Bombing Range. Photo taken 03/14/09. The next major intersection along Imperial County S-30 (Forrester Road) north is Blais Road. The road shifts northwest briefly beyond Blais Road. When roads were laid out in Imperial County in the early 20th century, they were generally built in a grid pattern from north to south and then from south to north. Due to some hasty construction, the alignments of the north-south arterials were not precise, leaving a few curves in the road such as this one. Photo taken 03/14/09. Northbound Imperial County S-30 (Forrester Road) approaches Cady Road, which travels due east to merge with California 78 and 86 en route to Brawley. Photo taken 03/14/09. Northbound Imperial County S-30 (Forrester Road) approaches Andre Road. Photo taken 03/14/09. 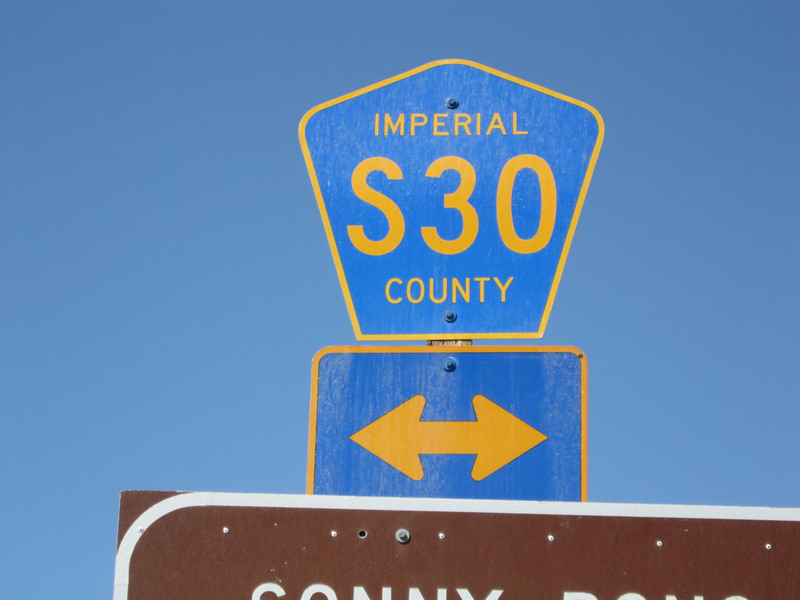 Imperial County S-30 (Forrester Road) continues one mile north from Andre Road to the Westmorland city line. Photo taken 03/14/09. Northbound Imperial County S-30 (Forrester Road) enters Westmorland, which had an estimated population of 2,269 per the Census in 2016. The city sits at an elevation of 159 feet below sea level and consists of only 0.59 square mile. The daytime headlights section ends here. Photo taken 03/14/09. The speed limit reduces to 25 miles per hour once CR S-30 enters the city of Westmorland after Baughman Road. Note the lack of pavement markings. Photo taken 03/14/09. Northbound Imperial County S-30 (Center Street) approaches First Street. Photo taken 03/14/09. A succeeding stop sign follows Westmoreland City Hall along northbound CR S-30 (Center Street) at Second Street. Photo taken 03/14/09. A trailblazer for Imperial County S-30 north precedes the Center Street intersection with the California 78 and 86 expressway (locally known as Main Street). Photo taken 03/14/09. Only California 86 is acknowledged from CR S-30 (Center Street) at Main Street in Downtown Westmorland. Traffic signals were added at the junction by 2015. California 78 & 86 head southeast to Brawley and west and north to Escondido and Indio respectively. Photo taken 03/14/09. This faded sign referenced the distance to the Salton Sea National Wildlife Refuge (11 miles) for Imperial County S-30 north from SR 78 & 86 (Main Street). Photo taken 03/14/09. Imperial County S-30 dog legs east from Forrest Road onto Gentry Road ahead of the New River. Gentry Road leads the county road north 3.4 miles to Eddins Road, which directs CR S-30 east to Calipatria. Gentry Road north continues to the Salton Sea National Wildlife Refuge and a hiking trail. Photo taken 12/19/02. Five miles east along Eddins Road, Imperial County S-30 reaches the city of Calipatria at Lyerly Road. Following Main Street, CR S-30 enters Downtown where it intersects SR 111 and SR 115. Photo taken 06/07/08. Imperial County S-30 concludes at a four-way stop sign with California 111 north to Coachella and Indio and south to Brawley. California 115 lines Main Street east from Calipatria en route to Holtville. Photo taken 06/07/08. A 1961 button copy, porcelain enamel stop sign in use at the intersection of Beverlee Way and CR S-30 (Forrester Road) in the city of Westmorland. Other than the date stamp, the sign does not have any emblems or indication referencing its installation (state Division of Highways or Automobile Club of Southern California). Photos taken 03/14/09.